Bank stocks were even stronger than the broad market, following positive earnings surprises from Best Buy and Urban Outfitters. NEW YORK ( TheStreet) -- Zions Bancorporation ( ZION - Get Report) of Salt Lake City was the winner among major U.S. banks on Tuesday, with shares rising 3% to close at $29.54. The broad indices all ended with gains, as investors settled down after four days of losses, and even poured some money into government securities. The market yield on 10-year U.S Treasury securities was down six basis points to 2.82% Tuesday afternoon. Investors turned their attention away from fears of a tapering of bond purchases by the Federal Reserve to a slew of positive earnings surprises. Shares of Best Buy ( BBY - Get Report) popped 13% to close at $34.80, after the electronics retailer reported fiscal second-quarter earnings from continuing operations of 32 cents a share, on revenue of $9.3 billion. Analysts polled by Thomson Reuters had expected the company to report EPS of just 12 cents and revenue of $9.13 billion. A major highlight for Best Buy was a 10.5% year-over-year increase in online sales, to $477 million. Comparable store sales, excluding online sales, were down 0.6% from a year earlier. Urban Outfitters ( URBN - Get Report) also played a happy earnings tune, with shares rising 8% to close at $43.19. The teen retailer following Monday's market close reported fiscal second-quarter EPS of 51 cents, exceeding the consensus estimate by three cents, with same-store sales up 9% year-over-year. J.C. Penney ( JCP - Get Report) shares were also hot, rising 6% to close at $14.01, even though the company reported a larger-than-expected fiscal second-quarter net loss of $586 million, or $2.66 a share, with net sales down 12% year-over-year to $2.66 billion. The company appeared to be making some progress on its turnaround and said it expected only a slight decline in liquidity through the end of the year. Heading into Wednesday, investors will be focused on the release of the minutes from the Federal Open Market Committee's most recent meeting. Clues are being sought on just when the Federal Reserve might curtail its monthly purchases of $85 billion in long-term securities, which has continued since last September. Anticipating a tapering of central-bank balance sheet expansion, investors have sent the market yield on 10-year Treasury bonds up over 110 basis points from 1.70% at the end of April. The Federal Reserve has kept the short-term federal funds rate in a range of zero to 0.25% since late 2008, and the FOMC has repeatedly said this "highly accommodative" policy was likely to remain appropriate at least until the U.S. unemployment rate dropped below 6.5%. The July unemployment rate was 7.4%, improving from 7.6% in June. The steepening of the yield curve is good news for most banks, however, it can take quite some time for it to provide a major boost to net interest margins, because some assets are still repricing at lower rates from several years back. The Federal Reserve will hold its annual conference in Jackson Hole, Wyo., beginning on Thursday. According to KBW analyst Brian Gardner, "Given the lack of a keynote speech by Fed officials at Jackson Hole, the minutes will probably be the more significant of the two events this week as the markets search for further clues on the timing as well as the composition of tapering of large scale asset purchases." Janet Yellen -- vice chairwoman of the Federal Reserve Board and considered the frontrunner by many to succeed Federal Reserve Chairman Ben Bernanke next year -- will not be giving a speech at the Jackson Hole Conference. However, she will moderate a panel discussion on Friday. " We expect every word she utters to be dissected," Gardner wrote in a note to clients on Friday. KBW Bank Index ( I:BKX was rose 1% to close at 64.50, with all 24 index components ending with gains. Big banks showing 2% gains included Morgan Stanley ( MS, which closed at $26.31; Cullen/Frost Bankers ( CFR, at $73.11; and Regions Financial ( RF, closing at $9.86. 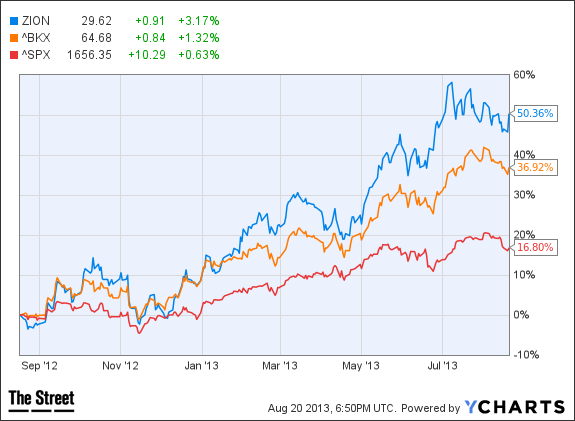 Shares of Zions Bancorporation have returned 38% this year, following a 32% return during 2012. The shares trade for 1.3 times their reported June 30 tangible book value of 22.09, and for 15.2 times the consensus 2014 EPS estimate of $1.95. The consensus 2015 EPS estimate is $2.27. 2013 has been another year of transition for Zions, following last year's repayment of $1.4 billion in federal bailout funds received through the Troubled Assets Relief Program, or TARP. This year the company has continued to reposition its balance sheet, through the redemption of $285 billion in 8.0% Series B trust preferred shares, an announced call of $800 million in 9.5% Series preferred shares, and the redemption of $257 million in senior notes with a coupon of 7.75%. Zions has replaced some of that funding by issuing $800 million in preferred shares with a weighted average dividend rate of 6.23%. In a presentation including in a Securities and Exchange Commission filing on Tuesday, the company said it expected "further improvement in profitability" from its capital actions, and that its net interest margin "remains strong relative to peers." Zions also said it would see "Significant earnings and capital upside" from its asset-sensitive position, "If short-term interest rates rise and/or yield curve steepens further." Zions reported second-quarter earnings applicable to common shareholders of $55.4 million, or 30 cents a share, declining from $88.3 million, or 48 cents a share, in the first quarter, but rising slightly from $55.2 million, or 30 cents a share, during the second quarter of 2012. Excluding $24.9 million, or 14 cents a share in costs from the redemption of trust-preferred redemption and retirement of debt, the year-over-year earnings increase mainly reflected the bank's improved credit quality. During the second quarter, Zions transferred $22.0 million from loan loss reserves, compared to a provision for reserves of $10.9 million a year earlier. Even after that transfer, reserves were very strong, covering 2.13% of total loans. A very low annualized net charge-off ratio of 0.06% during the second quarter, and net charge-offs at annualized levels below 0.50% of total loans over the past year, indicate significant further reserve releases ahead. Zions reported second-quarter net interest income of $430.7 million, increasing from $418.1 million in the first quarter, and $426.3 million in the second quarter of 2012, reflecting growth of average non-covered portfolio loans of 1% sequentially and 2% year-over-year. The company still has a way to go to join the ranks of regional banks with strong earnings results, in part because of the costs associated with the continued balance sheet restructuring. The second-quarter return on average assets was 0.61%, and the return on average tangible common equity was 5.73%. Interested in more on Zions Bancorporation? See TheStreet Ratings' report card for this stock.